The last few days have brought me just yards away from the UK’s headline making news stories. I am pleased to report that I have not been too affected by this and, as yet, will not be asking my friends at Colman Getty to secure publicity on the back of these experiences. On Wednesday evening, the dinner I was due to attend at London’s Mansion House was moved to Lincoln’s Inn, as a result of the G20 related scuffles happening in the City. How lucky I am that Bank tube station was closed, that I therefore didn’t alight there and that I didn’t then get herded with a large number of other innocent bystanders into the ever shrinking security cordon set up by the Metropolitan Police. On Friday morning, I sat in a plane on the tarmac at Stansted airport, waiting to take off. Our flight was delayed for an hour whilst we and 29 other planes waited for Airforce One to start its engines and leave for the President’s next destination. As the pilot told us, on this occasion, letters of complaint needed to be addressed to the White House rather than Eastjet. And I bet Mr Obama doesn’t have to pay for his coffee when he flies. Finally, today, after picking up the cats’ flea medication from the local vet, I joined a traffic jam as everything on and around the Green Man roundabout ground to a halt. The reason for the delay was quickly apparent as possibly the largest funeral cortège I have ever witnessed passed by. 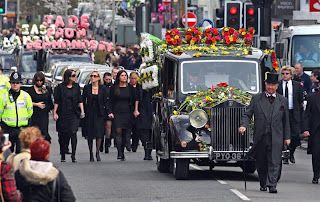 Several vintage hearses, piled high with floral tributes accompanied the one carrying the coffin. Jade Goody was on her way to Buckhurst Hill.